What is dropshipping? In this article, I hope to explain what dropshipping is and how this business model works. I will also provide a brief guide on how to start a dropshipping business with a little upfront cost. The world of eCommerce is growing at an exponential rate, according to eMarketer, eCommerce sales will rise to nearly $3 trillion by the end of 2018 and account for over 11% of all retail sales. This growth has opened up new avenues for entrepreneurs to start an online business. Whilst eCommerce is booming, it can be expensive to start a traditional eCommerce business, buying inventory in bulk,storage fees and delivery charges can add up and eat into your profit margins. This is where dropshipping comes in, without any of the mentioned expenses, you can start a dropshipping business on a small budget. Dropshipping is a very popular eCommerce fulfilment method with some reports saying that it may be used by almost 33% of all eCommerce operations. Before I go on and explain in detail how the dropshipping model works,I must warn you about a couple of things about this business model. Because the model looks really simple (and it is once you work everything out)unfortunately it is one of those things that has been twisted and warped by get rich quick merchants into a thing that is now synonymous with false promises of internet riches. There are a lot of marketers selling courses on dropshipping promising quick riches, many of them are not eCommerce experts and some have a little success and start selling a course. Do your own research before purchasing a course, there are certainly good ones, I mention some in this article but beware of those who make it seem easy and do not have a history in building successful eCommerce businesses. You can make a very good living from this business model but like everything in life, it takes hard work and effort to see success. It will not happen overnight and anyone with that mindset are bound to fail. The concept behind dropshipping is reasonably simple. It’s not exactly new, and it’s not exactly rocket science, but it is quite clever. In a traditional store, the store owner usually keeps stock in their warehouse. When someone orders something the store owner packages it up and delivers it to the customer. To start this kind of eCommerce business will set you back a few thousand dollars with inventory, storage and delivery costs. In a dropshipping store, there is no need to buy stock in bulk, storage costs or delivery charges. In fact, in most cases a dropshipping store owner never even touches the stock they are selling. The storage and delivery are taken care of by the supplier/manufacturer of the product. The process looks a little bit like this. What Makes Dropshipping A Good Business Model? So as you can see, dropshipping isn’t exactly a super secret advanced business model. The store owner essentially becomes a middleman between the customer and the supplier. There are several obvious (and a few not so obvious) benefits to doing business this way. This is one of the biggest benefits of running a dropshipping store. It’s also one of the biggest reasons the business model was jumped on by snake oil salesmen selling it as a get rich quick scheme. Dropshipping stores don’t require anywhere near as much capital to set up as traditional stores that hold their own stock. The beauty of dropshipping is that suppliers can (and do) sell items in individual quantities. You only order exactly the amount you need from the supplier, and you only order it after a customer has already paid you. This essentially means you need no start-up capital to invest in stock (you’ll have other expenses though). In addition to not having to pay for any stock upfront, your overheads will be much lower compared to a traditional online store. You’re not going to have to pay for a warehouse to store your stock (which means you save on rent and utilities). All you need is a laptop,a good internet connection and web hosting. I was hesitant to write this point down as a benefit, it’s what the snake oil “get rich quick” scammers like to trick people with. But it’s true that if you have a successful dropshipping business you can run it from anywhere in the world. Many people become “digital nomads” with their dropshipping businesses and travel the world while earning their income online. Perhaps the most exciting thing about dropshipping is the scalable nature of the business model. Traditionally scaling up a normal online store is a big decision that needs a huge amount of planning. You need to consider additional warehouse costs, inventory costs, and possibly even hiring people to help you run the day to day logistics. With a dropshipping business, you don’t need to worry about any of this. All your running costs are basically outsourced to the supplier. They have the warehouses, they have the staff, and they do the shipping. To scale up a dropshipping business, all you need to do is add more products to your website, sit back, and relax. What Are The Problems With Dropshipping? At this point in the article, it all probably sounds a little bit too good to be true. However, there are several downsides to dropshipping that the “get rich quick” scammers won’t tell you about. None of these downsides prevents dropshipping from being a legitimate business model, but it’s important that you are aware of them before you dive into it. Although suppliers will give you a discount,it will never be as large a discount you would get should you buy in bulk. Usually, you will get a discount of 15-20%, if you bring in a lot of sales,the supplier may increase the discount. The profit margins are lower than your traditional stock and ship eCommerce methods,however, this is offset by the fact you have less work to do and low overheads plus once you find a winning product and you can start to scale and grow your business. However, I must also add that profit margins can be exceptionally high if you decide to source your products from overseas (like China) like many dropshippers now do. The most important component of a successful dropshipping business is finding a reliable supplier (which is more difficult than it sounds). Your suppliers are going to be responsible for ensuring your customers get exactly what they ordered (within a reasonable timeframe). The performance of your supplier will directly affect the reputation of your store. The customer usually has no idea it’s the supplier shipping the products instead of you. If a supplier ships the wrong item (or a defective item), if they have delays, or if anything else happens – it’s going to make you look bad. You’re going to have to do a lot of emailing and admin every time something goes wrong. When you consider the thin profit margins this quickly becomes something that is not going to be worth your while. Take the time to ensure your supplier knows what they are doing before you even consider listing their products on your website. First thing is first, you need to find a product to sell, one that is profitable and ideal for dropshipping. This is the most important part of your dropshipping business, identify a product that has a hungry audience, if you can do that, you will be on your way to success. This is also a time-consuming task, fortunately, there are several places we can look for some inspiration. The product should be lightweight. No electronic or mechanical products. The product should not break easily. Should not be too expensive. People will buy on impulse. This is my favourite research method and I use it before anything else, keyword research is an essential part of your research phase and will help you decide if a product has enough market demand for it to be profitable. I have access to a few premium keyword tools but for this article, I will use Ubersuggest, this is a free keyword research tool from Neil Patel and will provide enough data to help you get started. One of my passions is Golf, I love watching it and so I decided to do some digging into this niche and see if I could find a product to sell. So after a bit of research, I found that the search term ‘Golf Gifts’ gets over 14,000 searches per month. The term also gets a massive spike during the Christmas period, however, the search volume over 12 months suggests there is a demand for golf gifts all year round. After searching through some of the top web results, I noticed that many of the stores were selling personalised golf gifts. Of course, you will have different interests but I hope you get an idea of how to come up with product ideas through keyword research. Remember, to follow the criteria for choosing a dropshipping product, so for example, while I was checking through the best selling items on Amazon, I found the product below that ticks all the boxes. The price for RFID blocking wallets range between $9.99 – $39.99 on Amazon, on Aliexpress I found similar wallets for less than $5. Say you mark up the price by 200% and sell it for $15 and shipping with ePacket is $1, that is still a $9 profit!! Sell 10 a day (conservative estimate) and you are close to making $100 per day. Even if you run Facebook ads and pay around $1-$2 for a paying customer, you are still making $8-$7 per order. I will give you one more example of how to find good products to dropship. One site I visit regularly for product ideas is notonthehighstreet.com. As the name suggests, you will not find items listed on that website on any of the popular eCommerce sites. Many of their products are personalised gifts. Personalised gifts are very popular and one of the most popular occasions for such gifts is for weddings. A gift idea that caught my eye was wedding guest books, prices started at $52 ( I have converted it from GBP). For a similar item on Aliexpress, the price is between $16.14 and $18.99, shipping is free for this item. If you priced this item at $35, you would still be pocketing $16 per order and wedding gifts are a huge niche and sell all year round. One other place you can brainstorm for product ideas is on the Shopify marketplace, this is where people put up their eCommerce store up for sale. It’s a good place to get an idea of what kind of products people are actually dropshipping and making money. After you have decided upon a niche, it’s time to go hunting for reliable suppliers. Finding reliable suppliers can be hard, fortunately, through Aliexpress it is made easier. Aliexpress has thousands of verified suppliers and they are all rated by their clients and you can use these ratings to choose a reliable supplier. Each is scored out of 5 and they are given an overall mark out of 100. Avoid suppliers with low amounts of feedback (even if their prices are lower) and low overall rating, the risk is not worth the additional hassle when you are just starting out. For a more in-depth article on how to find good suppliers on AliExpress read this article. This article shows you how to find profitable products on Aliexpress for your dropshipping business, but if you cannot find what you are looking for then the same principles can be applied to the following Aliexpress alternatives. These are very good alternatives and give you further options for suppliers and products. Although the only downside is that there are no dropshipping automation apps that are currently compatible with any of them. Buy a domain name for your store, make it is something relevant to your niche and that you get a top-level domain, preferably a domain name ending with .com. I usually purchase my domain names from Namecheap, they are as their name suggests, cheap and you receive 1 year free of WHOIS protection. Dropshipping apps – I mentioned earlier that there are apps that can make running a dropshipping business much easier and the best ones are only compatible with Shopify and WooCommerce. Resources and training – Shopify is simply the best when it comes to providing free training and resources on every aspect of running an eCommerce business. WooCommerce doesn’t have such extensive training materials but the dropshipping app that is compatible with WooCommerce has tons of guides and resources to get you started. All the hosting solution I have listed are optimised for WordPress and they all have guides and tutorials on how to install WordPress on your domain. Of course, if you go with the Shopify option, then your hosting is included, and you do not need to install any other software. After you have chosen your eCommerce platform, it is time to choose a dropshipping automation app. Since this article deals with dropshipping from Aliexpress, you have a few choices. If you decide to build your store on WordPress, I highly recommend the AliDropship plugin. This is one of the best dropshipping automation apps and will make running your dropshipping business much easier. This is a WordPress plugin and so it is only compatible with a store built on WordPress, so please keep that in mind before you purchase it. Automatic order tracking – Track your customer orders and automatically send them their tracking data. Discount coupons – Run sales and discount by offering them coupons. However, should you decide to go with Shopify as your preferred platform, you have a couple of options. The best option, in my opinion, is Oberlo, this is a lot like Alidropship but one major difference is that you can try it for free with Shopify’s 14-day free trial offer. Although my preferred choice is Alidropship because I know the WordPress platform so well, I honestly believe for people who have no experience in building websites, that Shopify and Oberlo is the best option. Shopify is easy to learn and Oberlo makes it easier to run a dropshipping business. Just do not spend to much time overthinking it because then you will keep on making excuses to delay taking any action. There is nothing more exhilarating than seeing your first sale come through, it gives you confidence and belief that your online business will succeed. So the sooner you make your first sale the better and there are a couple of ways to get some sales. Family and Friends – Don’t be afraid to ask family and friends to check your store out and even if they do not buy ask them to spread the word through social media, at worst you get some free advertising. Social Media Marketing – Create social media accounts for your store and start posting relevant content around your niche and raise awareness by engaging with your followers. Running multiple social accounts can be time-consuming, luckily there are several apps that will automate a lot of the tasks involved in social media marketing. One such tool is Social Rabbit that has been developed by AliDropship. It will automatically post content on Twitter, Facebook fan pages, Pinterest and Instagram, it will also like and comment on posts by other people which will increase awareness of your store. Find out more about this incredible social automation tool here. Video Marketing – YouTube is the second biggest search engine and it would be unwise to not utilise this free video platform. Ranking videos on YouTube is actually easier than ranking websites on search engines. Making YouTube videos has never been easier, there are so many ways to create engaging videos without needing to be in front of a camera. There is one such tool I use called Content Samurai and with it, you can create videos for YouTube and social media with little effort. Its a fantastic piece of software and great for those who are camera shy (like me ) and have difficulty creating videos. Click here for more information. Other ways of generating traffic include SEO, which is a long-term process and will need to be worked on consistently and paid traffic which can get you faster results but you will need a decent budget to test and find winning campaigns. So there you have it, an honest guide to dropshipping without all the hype. Dropshipping can be a lucrative business for people who put in time and effort and do not give up easily. I must re-iterate never fall for get rich quick schemes that make it seem dropshipping is easy and will make you rich with little effort. There are tons of resources that will help you get started with dropshipping, you really do not need to pay a huge sum of money to learn how to start a dropshipping business. Shopify, which is a billion dollar company, has its own Academy, where you can learn all about starting a successful eCommerce empire. It’s free to join and has tons of resources and training material. Click here to join the Shopify Academy. Shopify also owns Oberlo, which is the best AliExpress dropshipping app on the market, it comes with so many features that will help you run your dropshipping business more efficiently. Try Shopify and Oberlo for free by clicking on the button below. Oberlo Review – Best Shopify Dropshipping App? I am an Amazon seller and I have been interested in drop shipping for a while now. I decided to pick up the interest against since now is a great time to vamp up for Christmas. My problem was the fact that I could not find suppliers. I thought this would be the easy part. Also, it seemed like I had to buy a lot in bulk in order to get a decent return on the money. It still seems viable for sure. Do you know, or will you be coming out with more information on how to get a good supplier, or who some of these suppliers are? I also mentioned a ecom course called Store Coach, they provide a huge list of wholesalers and drop ship suppliers in their premium training. Hi Minhaj, I have heard a lot about the Drop shipping business but did not have a full detailed information about it before reading this. I think the business is a highly competitive one and requires a lot from a person for it to be successful. I had a friend that did it for a while before giving up, now I know why. Thank you for the information. Dropshipping, in my humble opinion, is a good business model that requires a lot of time to get results. What I’ve seen is that most people get frustrated because there is a lot of misinformation out there that says you can make money in a month. How is your own experience with Dropshipping? How much time does it take to get results if I work, let’s say, 4 hours per day? Yeah there is a lot of people making courses on dropshipping that make it seem they will be six figure earners in a month and this is where people fail,because as soon as they find out it takes hard work and have been lied to,they tend to give up.I actually do not do droshipping,although it is in my future plans,so as for how much you have to work on it daily, I cannot provide an answer for that. its really good to hear about drop shipping,it can be very profitable indeed. Wow! I’m so glad I came across your article! I’ve been considering already for a while the dropshipping thing, not knowing how and where to start. I always find articles with big promises, but without real information and no one talks about the difficulties like you did. So thank you so much! I tried to find a trustable supplier but gave up while searching. Do you have any tips about good methods to find good suppliers? Thanks for stopping by and commenting,I am glad you found the article helpful. As for finding good suppliers,you will most likely not find any good ones by googling. There are certain sites that list good dropship suppliers but most of them require you pay to gain access. Although if you want to dropship from China (whch seems to be really popular at the moment) then you have AliExpress,but again you will have to vet the suppliers and the products yourself and make sure that they are up to your standards. If you are interested in dropshipping,I highly recommend Store Coach,they have some good free training and that may help you decide if dropshipping is for you or not. I just created my website on the wordpress platform, using woocommerce. I am a blogger, so I know how to drive organic traffic and rank in Google with a blog, but how about an ecommerce shop? What do I have to do to rank in google, so that when visitors are looking to buy a specific product, my product shows up on the first page? Your help is greatly appreciated. Thanks for stopping by and commenting,ranking a eCommerce site is very similar to how you would rank for your blog. If you want a more in-depth guide I highly recommend this article by Brian Dean. I am trying to click on the link but it shows error. Thanks for letting me know,the link should work now. I had heard of drop shipping before as a concept and I don’t know exactly why but I don’t like it. Maybe because I find it a little boring to work with. I am more happy to work with affiliate marketing, as I can write about things I am passionate about and lead people to the seller’s page. This is more easy and interesting for me than drop shipping. I also think that drop shipping is quite difficult to start with. And boring. Anyways, I might start with it one day, after I start making some serious money with affiliate marketing. Do you know any good supplier for this? Hi Thanks for stopping by and commenting, I am the opposite,although I do enjoy affiliate marketing,writing content has never been my strong point,it takes me so long to put together a strong article that well help people.If I started over I would definitely start with dropshipping as eCommerce is something I always wanted to do and hopefully I will return to it,once my niche websites start making some good money.As for finding good suppliers,try places like Salehoo,Doba,AliExpress,you should find a supplier that meets your needs. Hi there. I just finished going through your article about drop shipping and just wanted to drop you a quick comment to say thanks. I have been considering drop shipping for some time. But as you pointed out in this article, finding a good product supplier is something that concerns me. I just had a look through a few of the links that you supplied on this page and I was blown away with the range of products available. Ali Express alone have so much. It’s a bit link a discount Amazon store. This has certainly given me something to think about. I can only go by what they state on their website,and although they give no numbers,they do say they have run and sold multiple 6 figure eCommerce stores. They also run a website brokering service focusing on eCommerce sites,so far they have assisted in the sale of over 160 eCom stores. You can see the latest eCom websites they have helped their clients sell here. Hey, man, thanks for the heads up on these exclusive ideas about dropshipping. I have always cherished this business model because of its simple nature. I have started one though with Shopify and now getting products on site as well as writing content. Drop shipping is here to stay and am happy to partner with its revolution lol cheers. Thanks for commenting, I wish you all the success in this venture. I have toyed with the idea of dropshipping for a while now, but never really knew much about it. Now I can see some of the areas I need to consider before I jump in. Like you mentioned in the article, getting a good supplier is everything, and I and doing a lot of research right now to make sure my business is a successful one. Thanks for the knowledge! Thanks for the comment and I wish you all the success in your business. Thank you so much for creating this post! I have recently been hearing a lot about dropshipping but was really unaware of how it worked. I’m so glad I found you site! After reading this post it makes so much sense! Working online can be such a scary idea to many but given the example about the store owner I think it feels much more attainable. I really appreciate the time you took to craft this post! I’m so glad I came across this article. I recently started a parenting blog, but I have been interested in selling products online for a long time. I have friends who do a variety of different things like LulaRoe and Plexus, but none of it was right for me and I’m not willing to put up a bunch of money up front for something that may or may not work out. Dropshipping seems like it may be the best option for what I’m wanting to do. I really appreciate the information and resources. Nice! Thanks for your thorough discussion of dropshipping. I’ve been really intrigued for a while now. Several friends of mine are doing very well with this business, and it’s caught my attention. Do you have a review that is specifically for Store Coach? It’s definitely essential to get education or mentorship of some kind, I know that… what’s your experience or research with Store Coach? Have you heard anything about Ryan Moran’s Business Builder Bootcamp? How do these things compare? Thanks for your comment, I have written a review of Store Coach which you can read here. I believe Store Coach is one of the best eCommerce training programs and they provide a lot of useful tools in the premium membership. I have heard of Ryan Moran and I know that he is big in the eCommerce world, I have never actually checked out any of his courses. I’ll put that on my to do list. Dropshipping can be a profitable business model. I have read a lot of true success stories. Also, there are a lot of companies and suppliers out there that have been doing it for a long time. My experience with it was not that good. One thing that you didn’t mention was that selling on sites like Amazon sounds good because of the huge market available to you. However, just like getting a website ranked on the first page of Google, it is extremely difficult to be listed by Amazon in the first position. And if you are not in the first position you are much less likely to sell anything. What does it take to get into the first position on Amazon? Well, you just have to sell something. Whaaaat??? That’s right, you have to sell something in order to be in a position to be able to sell anything! There are ways around this, but it is difficult, or costly, and the reason I got out of dropshipping. Affiliate marketing is easier and has fewer pitfalls. Great article. Dropshipping does work and your article explains very well how to get started. Hey. I have been wondering for a long time what dropshipping is and what I should do. Your post has answered all my questions and you encouraged me to try to start this business.. I’m thinking about creating a website for selling items. I think it will be a better and long-term solution. Could you tell me how much I have to invest to create such a website? To start a dropshipping business will not require a large investment. You can actually get started for less than $100. All you need to start a dropshipping business is a domain name and hosting. Domain names cost around $8-12 per year and WordPress hosting through providers like Bluehost,Hostgator,iPage etc cost no more than $10 pm. If you choose to host your store through platforms like Shopify,3DCart Bigcommerce,they have an initial 2 week free trial and then prices that start at $29 pm. There will be additional costs you will have to think abut like what payment processor you will use,marketing and advertising your store etc which will increase as your store starts to grow but starting out,the investment is small. I’ve been interested in dropshipping for awhile and this is a good summary of the pros and cons as well as the various options. I’m curious about the fees charged by ebay and Amazon if you choose to operate under their umbrella. If you decide to set up a store on Shopify or any of the others you mention here there is a lot more pressure to drive traffic to your store. Could you elaborate more on the avenues you recommend to drive the necessary traffic? Would a blog work for example? As for driving traffic to your store from other eCommerce platforms,blogging is certainly one way,you also have Social media,Video marketing and ads. Also when operating an eCommerce store you can run giveaways or discounts and let bloggers or online news outlets about your offers and see if they will feature your store on their site. A really popular method I am seeing now is to reach out to Instagram influences,give them a free sample for a free shout out. There are many other ways,just need to think creatively and take action. Hi, at the moment I’m an affiliate marketer. I like this system because not having to deal with suppliers and payments. I am not that experienced and haven’t looked too much into other possibilities like drop shipping so far. I think with open eyes and a greater SEO and website and marketing experience starting a drop shipping site might the next step. Thanks for this deep information. Thanks for stopping by and commenting,yes after you have mastered affiliate marketing,eCommerce should be something to consider. This is a good business to get into and I have heard so many good things. Just the other day I read an article where someone made one million dollars in this business. Thanks for an awesome post that has great information. Yes,this is a good business opportunity to start making a decent income online,thanks for your comment. Hi Minhaj, I have heard of drop shipping before but never really knew to much about it. An interesting post you wrote and it describes the process pretty clear, I would think you would really have to lock in some decent reliable suppliers to avoid any stocking issues and failed fulfillment for the consumer which might affect repeat business. Thanks for commenting,yes one of the most important aspects of eCommerce is finding reliable suppliers,which is why it is advised you get to know them before ordering inventory from them. Thanks for your comment and I wish you all the best with your business. The idea of dropshipping is certainly very attractive to people who want to work for themselves at home. I have tried it a couple of times last year dropshipping from Walmart/Amazon to Ebay but it didn’t work out. Things just weren’t selling and I lost a lot of money on store and listing fees. I haven’t tried AliExpress but I heard that shipping is from China and takes too long, what do you think about that? I only listed things that from my research were popular on Ebay, but these items have a lot of competition involved. I know some people are able to do it full time and make money from it, so I don’t know what I’m missing exactly. Every time I find what I thought was a good item I see that everyone else on Ebay is selling it for less. Then the price wars go all the way down to nothing and below, and so who’s going to buy my product for $20 when someone is selling it from China for $5? Thanks for stopping by and commenting, with eBay, its all about sales volume and making sure that your listing gets on the first page, that means optimizing your title and description for best results. If you are still interested in eBay dropshipping look up a guy called andrei kreicbergs on YouTube, he has some free training on how to successfully dropship from Amazon to eBay. My article is all about dropshipping from Aliexpress using Shopify and Oberlo, as for the long shipping times, this is solved through ePacket, which takes no longer than 2 weeks (usually less) and people are really not fussy about waiting times as long as they are made aware that of it before hand. I hope this answers all your questions. Thanks for commenting and I really appreciate your kind words. I wish you all the best in your future business ventures. I planned on doing dropshipping a few months back but I backed out because one of my friends who does it says it’s not profitable and worth your time. At present, I am slowly building my niche website. Is it possible to use this website if I plan to go with dropshipping later? How do I do that? I really do not know what your niche website is about, however, if there are products that are lightweight, not fragile and can be purchased for wholesale prices, then I see no reason why you cannot start a dropshipping buisness with your current website. Since your website is built on WordPress, you will not be able to use Shopify, but you have just as good a solution with WooCommerce. I have actually written a whole guide on starting a dropshipping business with WooCommerce which you can read here if you are interested. This is one of those articles where you read it several times because you are so intrigued. I have websites but I have been making cash via affiliate marketing and putting random adds on my side widget bar. I’m going to read this article again now. Thank you so much for this article because I’ve always wondered exactly what dropshipping is. I mean I’ve heard of it before and I’ve heard people can make money that way, but if not done correctly it is possible for it not to be profitable. I really like how you’ve broken down what dropshipping actually is, how the costs are lower than having traditional stock and overhead that you have to deal with, and how exactly to find products that people will tend to buy on impulse. You also said plain and clearly that dropshipping is not a get rich quick scheme and that it takes hard work to be successful which is as it should be. I like that you also showed a place to find a reliable dropshipping supplier. How long have you been doing dropshipping and has been very lucrative for you? I’m so glad I came across this article. i started a dropshipping business recently and it hasn’t been going well. That was due to me not doing enough research on the business.Dropshipping can be a profitable business model. I have read a lot of true success stories and thats why i decided to dabble in it, I have learnt a lot from this article and i hope i can utilize it in my business too. I have always been interested in knowing more about dropshipping, your guide really simplified it for me. I hope to one day start a dropshipping business after my affiliate marketing site starts making me some money. I will check out the Shopify academy, thanks for the advice about checking the free training before buying a course. Thanks for this easy to understand guide to drop shipping, I have heard about this business model but I never understood how it worked. 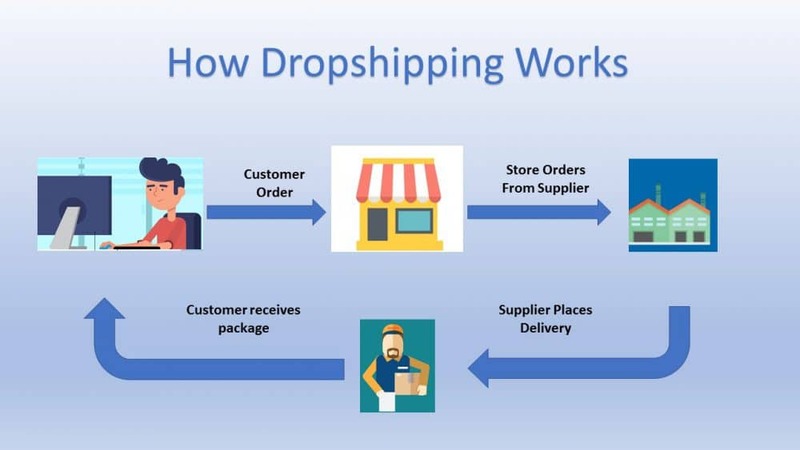 This guide does a good job of explaining how drop shipping works that anyone can understand. I am currently trying to make money online through affiliate marketing, however, drop shipping is something I hope to start sometime in the future. Thanks for your comment and I wish you all the best for your affiliate marketing business. I agree with you in your “About Me” post. There is so much information on the internet about online marketing. It is hard to determine what’s real and what’s not. Who can you trust? I struggle with self-doubt myself. I always wonder if I am doing this correctly. Getting straight forward information from people like you helps me move forward. It is so nice to read posts that are useful in what I am trying to do on the internet. Your explanation of “How Dropshipping Works” helped me to better understand the whole process. The image showing the cycle of dropshipping was a very nice touch. For me, visuals are always a good tool to use on one’s website. Good job on pointing the “goods” and the “bads” of dropshipping. The tip on “supplier reliability” is an excellent point. If you can’t trust your supplier, then your buyers won’t trust you. This is a well thought out and detailed post about dropshipping. I learned so much. Have you run a dropshipping business yourself? If so, how long and how did it go for you? Thanks for your comment, appreciate the sentiments. Everyone has doubts, I still have doubts, that is where mindset comes into play. If you determined to succeed no matter how many times you fail, you will hopefully get there. The trick is consistency, motivation and never give up. I am glad you found this article helpful. Been looking at starting a dropshipping business, but was still a little foggy on the mechanics of the whole business model. This article has helped me understand it better. Thanks for the recommendations near the end, it’s good to know about these free courses, will check them out before I consider any paid programs. Thanks for your comment and you should definitely register with Shopify Academy, it is full eCommerce course and completely free. I absolutely love this insightful article because it is full of great information. This is fascinating and intriguing to me,I’m an affiliate marketer and I wish to expand my income through other online opportunities. Dropshipping is something I am definitely interested in doing some time in the future. Thanks for this insightful article. Thanks for your comment and you should definitely look into dropshipping once your affiliate business has been established properly and making you a good income. This article simplifies what dropshipping is and how to start a dropshipping business. I have actually heard about this type of business but wasn’t really interested but I have seen people selling courses on YouTube and it sounded interesting and so I wanted to find out more and I came across your informative and easy to understand article. I am currently looking to become an affiliate marketer but I will bookmark your site for later reference if I ever decide to pursue dropshipping. Thanks for your kinds words and all the best in your affiliate marketing journey. Oh, now I understand what dropshipping model is. I heard about it once from my friend but didn’t really understand the concept and business model. This is quite suitable with me, because I don’t have large capital to start investing in offline store or normal online shop. So, is it mandatory to have a website or can I just it through social media? Thank you. Thanks for your comment, you do need a website, you can sell on Social media sites like Facebook, Instagram and Pinterest, but you will need a website where you can take payments. Plus having a website gives your business more legitimacy and trust.